Want Us In Your Store? Welcome to Good-Rich Honey! 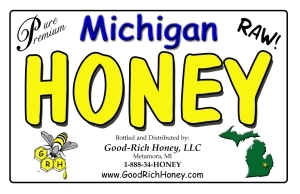 Where we are all about Raw Michigan Honey. Our site offers information about who we are, the products and services we provide and lots of info about why our Pure, Raw, Michigan honey is so great! Why Buy Pure Premium Raw Michigan Honey? We pride ourselves in providing the best honey to our customers and bottle only honey which meets our high standards of quality. All of our honey comes directly out of hives in Michigan only so you can be assured that the honey in the bottle is from here in Michigan and are never imported, from out of the country or even out of the state. You won't see any 'Product of US, Argentena, Canada or India' labels on our bottles like you find on many other honey you see on your stores shelves! We strongly believe our Pure Premium Michigan honey is best honey you can find. See our frequently asked to the right for more information on why. Look for our rack of our honey products at a store near you. If you are a retailer looking to have us setup a rack in your store visit our Want us in your store? page for more information about the benefits of the services we provide. Raw honey is honey in the purest form. We do not flash heat, filter or process the honey in order to preserve all of the minerals and nutritional benefits which can be lost by processing. By buying our Premium Raw honey you can be assured that your honey is in the purest form without any processing that can take away many of the health benefits of pure premium raw honey. Will raw honey help my allergies? Various studies have shown that for some people, eating a teaspoon of raw local honey a day will help with their allergies. We encourage our customers to check out the articles under 'Great Links' on the menu to the left as well as browse the various articles and studies online about the numerous benefits of raw honey. Why do you call your honey 'Pure Premium'? Michigan honey is arguably one of, if not the best kinds of honey you can buy. Since we use only the best Michigan honey and provide it to you as raw honey in order to preserve all of the benefits that go along with raw honey it is pure and premium, straight from the hive to your home. Do I need to cook 'Raw' honey? No, you can enjoy raw honey just as it is. However, have a look at our recipes under 'Great Links' on the left. There are many recipes which you can use honey in where you might want to cook with it! My bottle of honey turned cloudy, did it spoil? Over time the natural sugar crystals in raw honey will crystalize, it sounds like this is what happened to your honey. To remove the crystals, all you need to do is warm it to disolve the crystals. One recommended way is to place your bottle honey into a container of hot tap water. The crystals will melt down again back into liquid honey. We recommend you don't put your container of honey in the microwave! I opened a bottle of your honey I just bought and there is white stuff at the top, is this anything I should be concerned with? Since our honey is pure, raw, unfiltered honey, what you're seeing is the result of bottling. It's a mixture of wax and air bubbles settling to the top and is perfectly normal for raw honey. Larger companies often heat their honey to high temperatures as well as filter their honey to remove all those particles you sometimes see in our honey. This is to increase the clarity and extend the time it takes for the honey to crystalize, however this removes many of the benefits of raw honey which we pride ourselves in offering.